It's getting kind of spooky around here with the very slow news week that we're having here, but Digital Digest is like a zombie, and we're back for what we do have! 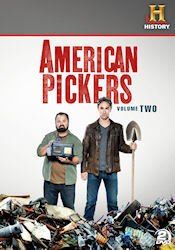 This week, we have a review of American Pickers - Volume Two. Also, in keeping up with our Halloween theme, we have another website related to the "spooky and supernatural" as our pick of the week. Let's get moving! We only have news of one new release this week, but it is certain to be one to please many people! The contemporary classic sitcom, Family Matters, is returning to DVD for the second season on February 14. We don't know many details yet, but we assume it'll be just a barebones set. Still, it is good to see the series continuing. Our only other news concerns a delay for a DVD set that was expected this week. The classic drama It Takes a Thief - The Complete Series was expected on DVD next week, but that has been delayed to November 15. It looks like it is going to be a really good set, though, and we will be reviewing the set in Digital Digest sometime soon. Tuesday (October 25) brings only two releases from Shout! Factory, but they are good ones. The best one is Barney Miller - The Complete Series, a 25 disc collection containing every episode of the series and even the first season of the spinoff Fish. The other release for Tuesday is Dennis the Menace - Season Three. Unfortunately, we have not received review copies of either of these sets, but if we do, we'll definitely have reviews of them. In small towns, and along America's back roads, treasures are waiting to be uncovered - valuable relics from our history that are hidden in junk piles, buried in barns and stacked in garages. It takes experts to find them - and turn rust to riches. American Pickers follows two of the most skilled "pickers" - Mike Wolfe, owner of Antique Archaeology, and his business partner, Frank Fritz - as they hunt down objects with historical, collectible and pop culture value that have been long forgotten by their owners. Along the way, they meet people whose own stories open a window into American lives and history. In this collection, Mike and Frank try to strike a deal with NASCAR Champion Ryan Newman, explore the appropriately named Pickens, South Carolina and try to buy a 300-pound boot. The 2-disc set contains episodes 1-8 from the second season (2010-11). It comes in an Amaray movie-style case, just like the first release. Frank and Mike are pictured on the front holding a car part and shovel and standing on a pile of junk. A synopsis of the set, episode titles and the DVD specs are listed on the back of the case. Frank and Mike are featured on the spine of the case. There is an insert inside that promotes their new book: American Pickers Guide to Picking. There are no episode summaries included. An episode guide would have been nice to have for reference. The discs have the same photo of Frank and Mike that is used on the front of the case. The show logo is at the top, and the episode titles are listed at the bottom. The main menu opens with a montage of video clips that play while some music can be heard in the background. These clips run about 20 seconds before leading to the static menu. They feature the same photo of Frank and Mike that is used elsewhere. Episode titles are listed on the left side of the screen in white text. The highlighed episode is in yellow and turns gray upon your selection. When you select an episode, it takes you to another menu where you can choose specific scenes. Different backgrounds of the various locations are used on these menus. Chapters are placed at the appropriate places. As you might expect from such a recent show, the video and audio quality is excellent. They are presented in 1:33.1 format. The total running time of the 2 discs is approximately 6 hours, 16 minutes. All of the episodes appear to be unedited, with running times of over 43 minutes. If you want high definition episodes, they can be found on iTunes or Amazon.com . The audio is a Dolby Digital 2.0 Stereo track. Closed captioning is available on the episodes. Art of the Deal (06/01/10) (43:44) - Mike and Frank comb through a master collector's untouched outbuildings in North Carolina. After getting past a few petrified hams they find a true gem, a 1950 Studebaker that Mike falls in love with. But can Mike negotiate a deal at a price that makes sense? Mike then becomes obsessed with a 1934 pre-Airstream trailer and the negotiation becomes a classic in its own right. Next, hoping to sell a choice vintage sign, they pay a visit to friend and NASCAR champion Ryan Newman, who has a surprise of his own for the guys. Buddy's Booby Trap (06/14/10) (43:18) - Mike and Frank visit a local legend in North Carolina. After picking through an accumulation of school busses and a burned down storage house, they come across an item the guys have never seen before, place bets on what it actually is, and get surprised by what the appraiser says about it. Frank goes into picking-turbo-mode when he finds a gold mine of signs on a 20 acre farm. Also, a mother/daughter team catches the picking bug and gives the guys a run for their money as they dig through their grandfather's garages and outbuildings. Gordon's Gold Mine (06/21/10) (43:27) - In aptly named Pickens, South Carolina, the guys scour the sprawling inventory of a father-and-son picking duo. They uncover plenty of rare and unusual items... But can they make a deal with the two pro collectors? Next, the guys meet Mary who has inherited a 300-acre property, home to a huge untouched collection. After warming up with a few impulse purchases, Mike and Frank get serious. Plus, while trying to convince the guys to take her on the road, Danielle leads them to an inconspicuous cement factory. It's the "Holy Grail" of picking--Gordon's collection includes a jam-packed vintage general store, and building after building of unbelievable retro treasures. Smooth Operators (06/28/10) (43:19) - As the guys are winding down their trip through the South, Danielle finds them the mother lode of rare motorbike parts in an old warehouse packed with new vintage Harley stock. Can they convince the sentimental and savvy owner Billy to part with some choice items? The guys make an incredible discovery guaranteed to impress their friend and NASCAR champion Ryan Newman. Plus there's plenty more finds on the 11-acre property littered with racecars and jam-packed outbuildings. And, back in Iowa, Mike and Frank have a field day scouring an incredible collection of one of their decorator clients. But will they spend all their money before coming across the real treasure? Getting the Boot (07/05/10) (43:32) - While in Kansas, the guys comb through a promising farmyard littered with stuff but are frustrated when they find nothing at all to buy. Their luck changes when they meet demolition expert Johnny Walker. His collection is staggering. But will he agree to part with a rare grave marker and giant 300-pound boot? The next day, Johnny refers the guys to his collector neighbors. Junior's magnificent oilcan collection leaves Frank speechless, but unfortunately so does his sky-high prices. Morris on the other hand proves to be in a wheeling and dealing mood when the guys pull into the old service station that now houses his sprawling collection of automotive memorabilia. Easy Riders (07/26/10) (43:20) - Mike and Frank are in Missouri, heading towards an inherited old farm with plenty of promise. But then Danielle calls with news about an ultimate prize. She's tracked down a prolific collector with a rare 1937 Harley Knucklehead. Close to their target, and revved up about the classic bike, the guys agree to speed pick the old farm before moving on. But once there, Mike gets lost in multiple outbuildings filled with possibilities. Everything is for sale--but anything of value? Down the road, their next pick is with a self-made man who keeps his incredible collection of "mantiques" in a 1920s Ford dealership and theatre from the same era. The guys are in pick heaven...and when they spot the Harley Knucklehead, high-roller negotiations begin. Can they seal the deal? And finally, in spite of the unwelcoming sign on her sprawling property, Darlene is anything but. Psychic Pickings (08/02/10) (43:45) - While picking in Missouri, the guys stop in at Sam and Stan's steel yard where the father-son duo takes them on a high-speed golf cart tour of their massive hangar and outbuildings, loaded with heaps of metal and rusty junk. But can Mike and Frank uncover anything worth buying? The team goes freestyling and comes across an old farm where the owners are about to have an auction and badly need Frank and Mike's help. And, in Illinois they come across Greg, who claims he's a psychic picker. He's filled his mammoth home, a former prison, with rare objects and cultural artifacts. But is anything for sale? Plus the guys challenge Danielle to sell an old Studebaker they had picked. Does she rise to it? One Pony Town (08/09/10) (43:19) - Thanks to his vast collection of stuffed animals and weird curios, lifelong picker and yard sale aficionado Lester is known by his neighbors as the "spooky collector." Tension builds between Mike and Frank over the value of the animals, but both are thrilled to comb through his jam-packed outbuildings. Later on, the guys visit a hard-core Illinois collector who says he wants to downsize. But although his overcrowded building is technically for sale, he doesn't seem ready to part with anything. Missing family and friends, the guys pay a return visit to their "picking mamma," Judy. While scouring her mammoth former factory home, they have a great time, do great business and get a surprise. Plus an appraiser gives Mike some impressive news about a tiny stuffed horse. Unfortunately, there are no special features included. It would be nice to see some deleted scenes, cast interviews or other featurettes. Fans would crave this type of bonus material. I first watched American Pickers on History's sister channel Lifetime last December. After viewing a few episodes, I instantly became hooked. This is a show that is both educational and entertaining. They meet some unusual characters on their trips that have some fascinating stories to share. It's easy to see why this is one the biggest hits on cable. Mike and Frank have known each other since the 8th grade and work well together. They are kind of like a modern day Laurel & Hardy. Danielle is also an important part of the show and business. She's the glue that keeps things running smoothly and sends them out on the leads. Sometimes I think they play up the profit angle a little too much, but these guys know their stuff and have a business to run. I don't think they ever intentionally make lowball offers. Their offers usually seem pretty fair. It's all about negotiation. I think most people are just happy to clear some space and get rid of some of their junk that would otherwise be collecting dust. Another interesting aspect of the show is that sometimes they get shut out when people don't want to sell their items. Some of the items they buy end up being worth a lot less than they expected. The only disappointment with this set is that it contains only 8 episodes. This set was originally listed on Amazon.com as the Complete Second Season, but it was delayed several times and eventually changed to Volume Two. Season Two had a total of 26 episodes, so it will be interesting to see if the third volume will contain 8 more episodes or the remaining 18 episodes form the second season. On the plus side, it's listed at under $9.00 on Amazon.com. It's priced very affordably and would be a good blind buy. If you enjoy these 8 episodes, then you could go back and purchase the Complete First Season. They are currently in their third season. A total 50 episodes have aired at this point. New episodes can be seen on History on Sunday nights at 9/8c. The Twilight Zone Archives (www.twilightzone.org) - We continue our Halloween theme for Click of the Week this week with a website for a series that is considered one of the greatest classics of all time, and we have a website that is in a dimension of its own... The Twilight Zone Archives. It is one of the older websites for the series that can be found on the web, but it is also one of the more creative ones, and it is filled with plenty of content to keep you occupied. But before you do anything, be sure that you click on and read the information on how to navigate the website. It is no ordinary website, and you'll need to get accustomed to the unique interface or else you'll be lost! On the website, you'll find everything that you ever needed to know about the series. Of course, there is the usual episode guide, but what if you want to find episodes by a certain theme? There is a way to look that up. You'll even find episode information for all of the "updated" versions of the series (even that horrid UPN remake). You'll also find flubs, memorabilia, candid reflections on the series, behind-the-scenes information, galleries of props, and so much more on the website. It'll truly take you in to a place called... The Twilight Zone.